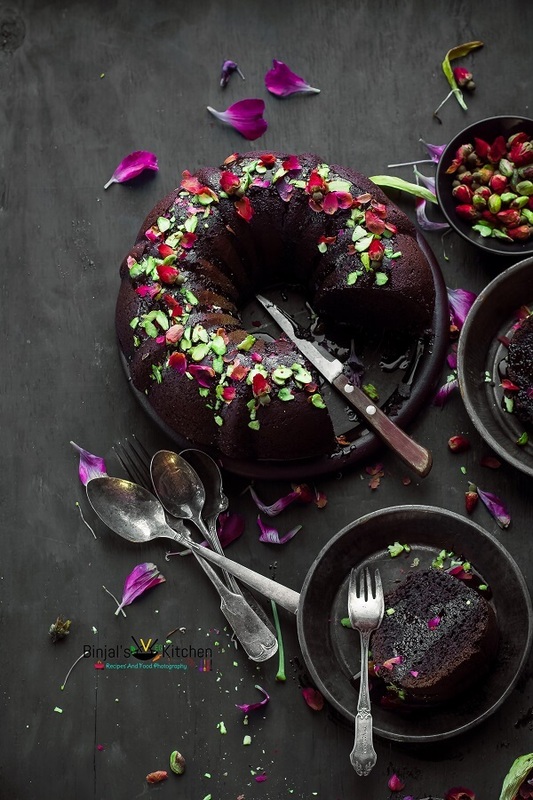 Vegan Chocolate Bundt Cake is Eggless, dairy free, but very rich and moist dessert. Vegan Chocolate Bundt Cake is very easy to make. Vegan Chocolate Bundt Cake is perfect for vegans and non-vegans, and I am confident nobody is going to miss the eggs, dairy milk and butter. I love this cake a lot, and it’s perfect for busy home cooks. It is a huge hit in my family, quite easy to make as well. I’m not a cake person, but this cake made me to change my dissension. It is an impressive dessert that goes well with just about anything, from your morning coffee to your afternoon tea, and so easy to make beautiful. Just whip up the batter, pour it in the pan, and top it off with a delicious chocolate glaze or simple icing or just top it as per your choice. 1. Preheat the oven on 350F or 175C. 2. In a mixing bowl, sift the dry ingredients (Flour, Cocoa powder, Sugar, salt, baking soda and baking powder) and mix it well. 3. In another mixing bowl, add warm milk, instant coffee powder and mix it till dissolved, then add oil, vanilla extract and mix it again. 4. Add wet ingredients mixture into the dry ingredients and mix it well. Add white vinegar and mix it all using spatula/wire whisker or a hand mixture till smooth and lump free batter. 5. Take a bundt cake pan, coat the inside pan using oil and dust it with flour or you can just nonstick oil spray. 6. Now pour the mixture into the pan and place it into the preheated oven. Bake for 45-50 minutes at 350F (do check with a toothpick) until a toothpick comes out clean and the cake springs back when gently pressed. 7. Allow to cool in the pan for 10 minutes, then turn out onto a wire rack to cool completely. 8. 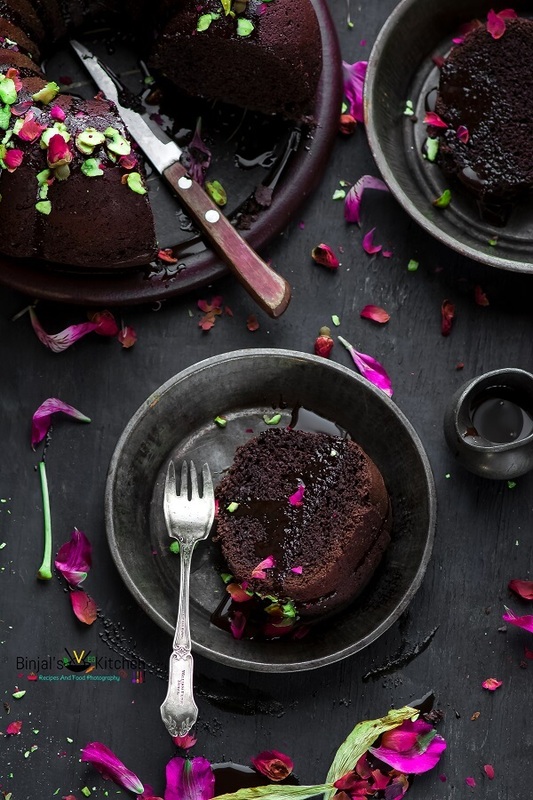 Once the cake is cool, top up with any glaze or chocolate syrup, garnish with sliced pistachios and rose petals and enjoy. • You can use water instead of milk. • You can add dry fruits, chocolate chips as per your choice. • You can store the cake, well wrapped at room temperature, for up to 3 days. 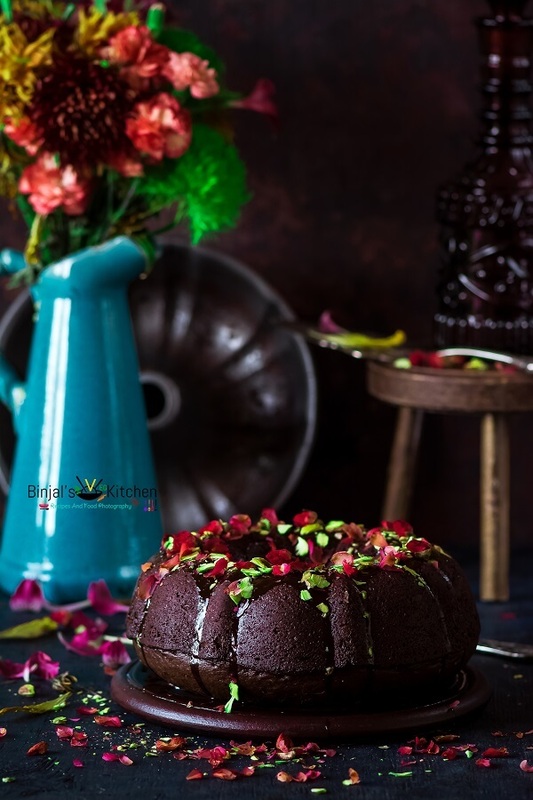 Vegan Chocolate Bundt Cake is Eggless, dairy free, but very rich and moist dessert. Vegan Chocolate Bundt Cake is very easy to make. Vegan Chocolate Bundt Cake is perfect for vegans and non-vegans, and I am confident nobody is going to miss the eggs, dairy milk and butter. I love this cake a lot, and it's perfect for busy home cooks. It is a huge hit in my family, quite easy to make as well. I’m not a cake person, but this cake made me to change my dissension. Preheat the oven on 350F or 175C. In a mixing bowl, sift the dry ingredients (Flour, Cocoa powder, Sugar, salt, baking soda and baking powder) and mix it well. In another mixing bowl, add warm milk, instant coffee powder and mix it till dissolved, then add oil, vanilla extract and mix it again. Add wet ingredients mixture into the dry ingredients and mix it well. Add white vinegar and mix it all using spatula/wire whisker or a hand mixture till smooth and lump free batter. Take a bundt cake pan, coat the inside pan using oil and dust it with flour or you can just nonstick oil spray. Now pour the mixture into the pan and place it into the preheated oven. Bake for 45-50 minutes at 350F (do check with a toothpick) until a toothpick comes out clean and the cake springs back when gently pressed. Allow to cool in the pan for 10 minutes, then turn out onto a wire rack to cool completely. 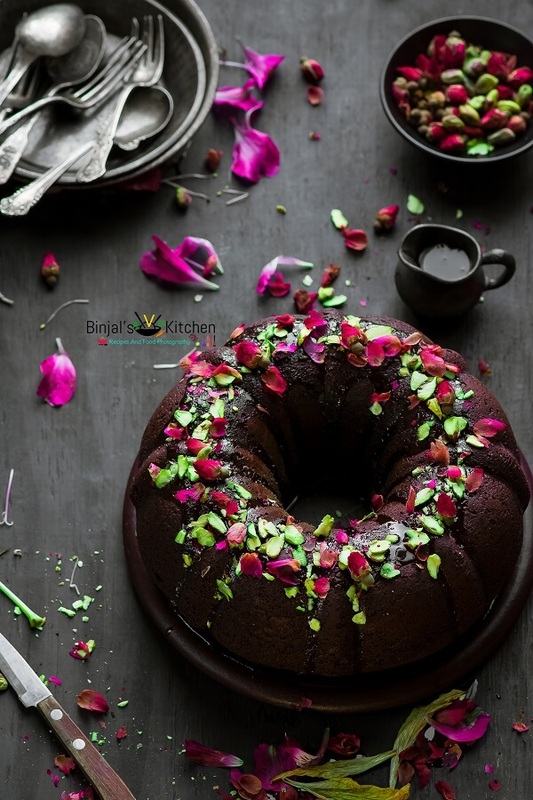 Once the cake is cool, top up with any glaze or chocolate syrup, garnish with sliced pistachios and rose petals and enjoy.